Edge-to-Edge Printing vs. Over-the-Edge Printing: What's the Difference? Printing ID cards can be a confusing undertaking. While most people would love a simple solution that allows you to put a blank card in and get a printed one out without much thought, that's never the way it works. People unfamiliar with ID card printers are often under the mistaken impression that these machines must be similar to standard paper printers; after all, printers are printers, right? Choosing an ID card printer requires making dozens of small decisions. 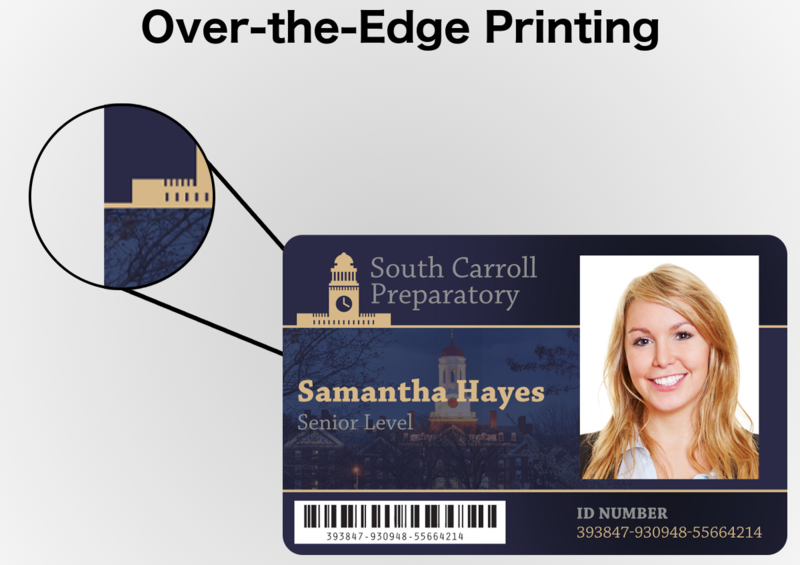 Unlike the "color vs. black and white" debate that countless offices and households have when shopping for a new paper printer, the search for an ID card printer requires a more detailed discussion. One-sided printing or dual-sided printing? Smart card encoding or no? Magnetic stripe encoding or no? How many cards will you be printing on a monthly basis? Overwhelmed yet? Hopefully not, because we haven't gotten to one of the most important questions yet: do you want edge-to-edge printing or over-the-edge printing? Before you answer, let's take a closer look at what separates the two styles.